It’s never been easier to enjoy holiday plant-based recipes, and that’s definitely something to be thankful for! 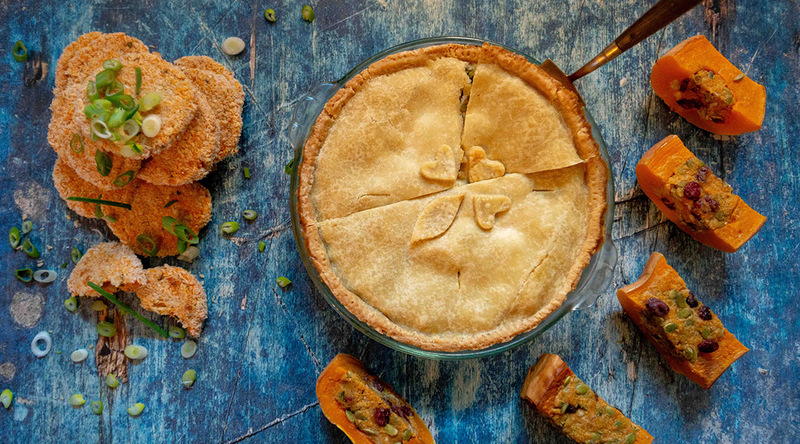 From the many meat alternatives lining grocery shelves, to all the new and inventive ways both chefs and home cooks are using vegan ingredients, there’s an abundance of resources available to help you celebrate any holiday in a healthier, more compassionate way. While there’s nothing wrong with tofurky, we wanted to give you some more inventive options for main dishes this holiday season. We’ve got stuffing that will leave you feeling stuffed, a crunchy take on sweet potatoes, a main dish pie, and more. And these recipes aren’t just for vegans! We know these dishes are so tasty, Grandma will love them, too! A note: with the exception of the gnocchi, all of these recipes can be made a day or two in advance. If pre-cooking your recipe, remove it from the oven 10-15 minutes before it’s finished so that it won’t dry out when reheated. Also, since many of these recipes use eggs for the classic versions, we opted for “vegan egg replacement” products. These are powdered items sold in the baking aisle of your local grocery store. Stuffing as a main dish? When you liven it up with plant-based chorizo, yes! Melding the Southwest flavors of cornbread and spicy sausage with standard T-Day herbs and veggies, this stuffing is one that can hold its own at the center of the table. 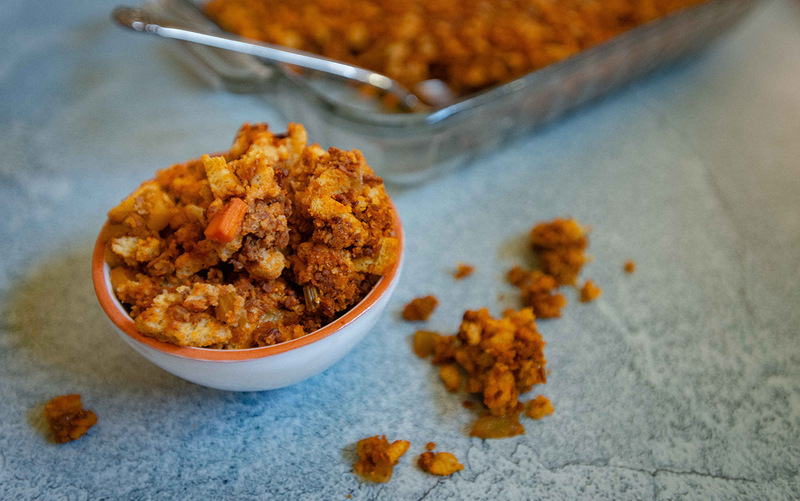 Plant-based chorizo is filling, thanks to containing about 4 grams of protein per ounce, and it is extra satisfying thanks to its moderate fat content — though it still contains less than half the fat of conventionally made stuffing. 2. In a pot over med-high heat, melt vegan butter. 3. Add chorizo, vegetables and herbs, and sauté until cooked through, about 10 minutes. Remove from heat. 4. Combine chorizo/veggie mix with bread cubes, egg and broth, and stir until combined. Add more broth, 1-2 tbsp at a time, if mixture is not thoroughly moistened. 5. Transfer stuffing into a greased 11 x 16 baking dish and bake until golden on top, about 30 minutes. 2. 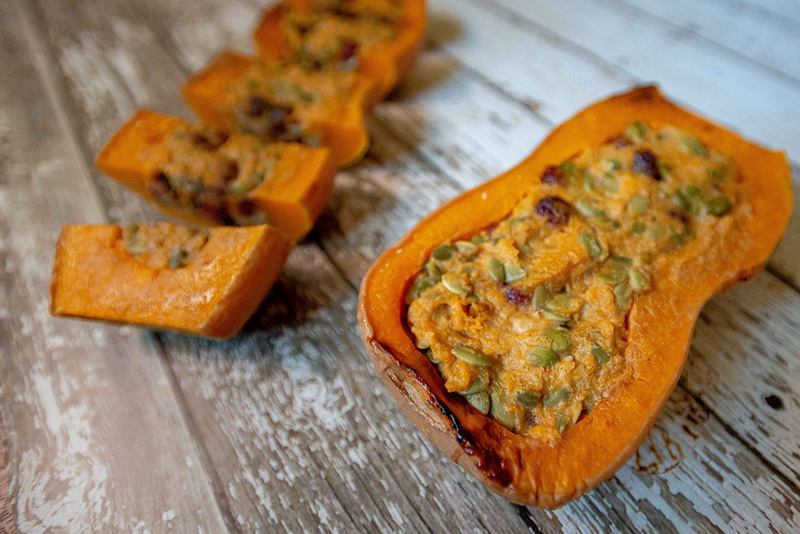 Split squash in half, remove stem and seeds, and roast until tender, 35-45 minutes. Let cool. 3. Scoop out butternut flesh with a large spoon, leaving ¾ to 1 inch of meat in the shell. In a mixing bowl, mash all ingredients together. 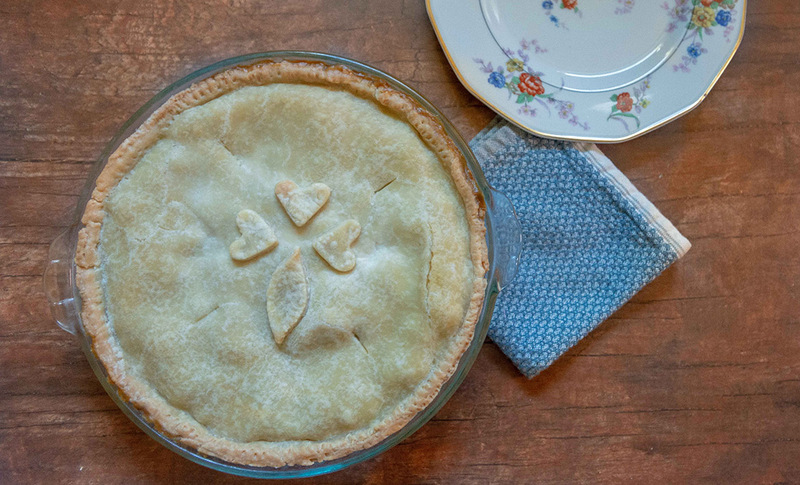 Pies are prevalent throughout the holidays, and seem to hit their peak at Thanksgiving. Bring this popular dessert item to the land of main courses by filling it with healthful vegetables baked in a delicious, rich sauce. Celery, carrots, and onions are known as mirepoix. The classic veggie combo brings comforting flavors along with antioxidants and fiber. You can swap out any of the veggies for others you prefer, but we recommend you use at least one root vegetable so it stays hearty. 1. In a large pot over med-high heat, add olive oil. Once warmed, add all vegetables except garlic. Sauté for 5 minutes. 2. Add garlic and flour; sauté for 1 minute. 3. Add remaining ingredients (except 1 tbsp milk), stirring until mixture comes to a light boil. Reduce heat to a simmer and simmer, stirring occasionally, until sauce is thickened and vegetables are tender-crisp, 10-15 minutes. Remove bay leaf and let cool completely. 4. Preheat oven to 350 degrees and place one round of pie dough into a pie plate. Pour filling into pie crust, then top with additional crust, sealing at edges. Make several slash marks with a knife for steam to escape, and brush crust with the reserved 1 tbsp milk. 5. Bake until golden, about 20 minutes. Sure, you could just mash some yams and call it a day, but it’s a much more fun choice to make a crunchy main dish out of these delectably sweet tubers instead! Veggie croquettes are usually a fried item; we’ve added health value by baking them instead. White beans round out the croquettes’ creamy texture while offering a protein boost, and using both chives and scallions gives them a diverse mouth feel along with some zing. 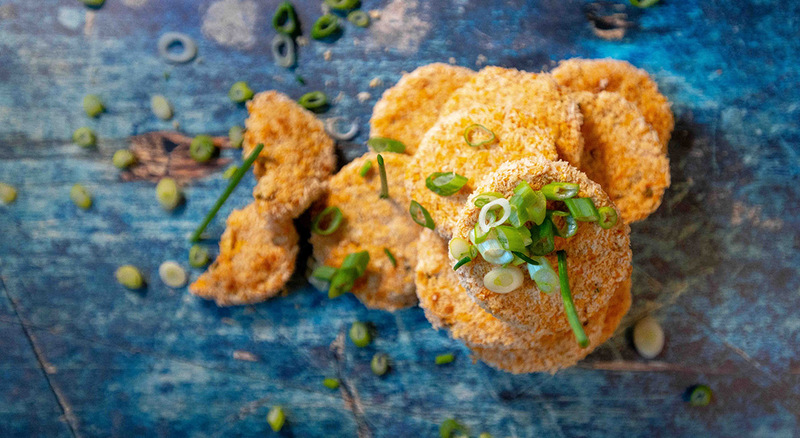 Panko bread crumbs will yield a more festive look than plain, so consider trying them if they aren’t a usual ingredient for you. 1. Boil sweet potatoes until tender, about 10 minutes. Drain and let cool. 2. Mash sweet potatoes in a mixing bowl with white beans until smooth. 3. Add remaining ingredients, setting aside 1 cup bread crumbs. 5. Stir until well combined, then scoop into balls the size of large golf balls. 6. Roll in remaining bread crumbs and flatten gently into discs on a greased cookie sheet. 7. Bake until golden, about 35 minutes, flipping over after 25 minutes. A riff on the classic dish of gnocchi with sausage and kale, we opted for straight tempeh as a sausage replacement because it’s nutrient-dense and crumbles as well as any vegan sausage could. Making gnocchi isn’t nearly the daunting task it seems like it might be! It’s barely a half-hour affair from start to finish, and you can prep the gnocchi dumplings ahead before cooking the dish on the day-of; simply refrigerate or freeze them until ready to use. 1. In a large pot over med-high heat, add olive oil. 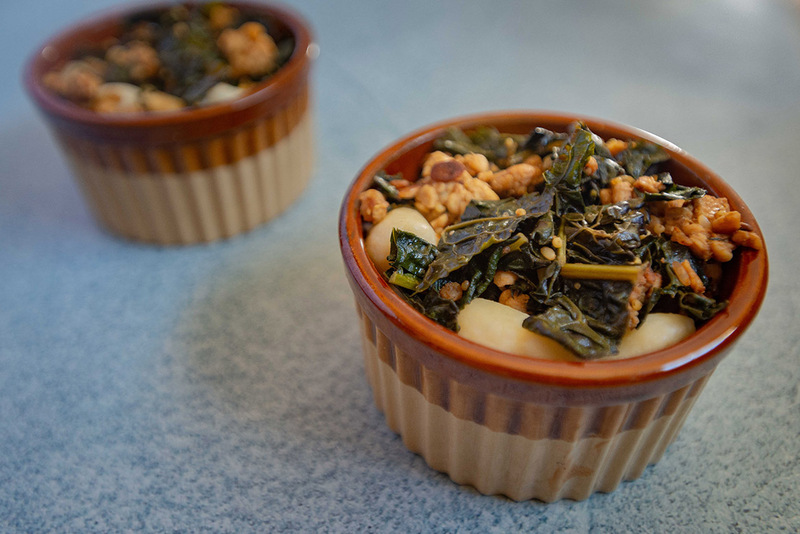 Once warmed, add tempeh and kale. 2. Sauté until both are cooked through and lightly browned, about 10 minutes. 3. Meanwhile, bring a pot of water to a boil; add gnocchi and cook until they float, then drain. Place gnocchi in serving bowl. 4. Add garlic and sauté an additional 2-3 minutes, then add gnocchi and turn off heat and add all remaining ingredients to the pot. Stir to combine, then pour over gnocchi to serve. 1. Boil potatoes until soft, about 15 minutes. Drain and let cool. 2. With a ricer or potato masher, mash potatoes until very creamy. 3. Add salt, vegan egg, and ½ cup flour, and mix until a dough is formed. After initial ½ cup of flour, add 1 tbsp at a time until firm enough to hold together. 4. Knead until all flour is well-incorporated into the dough. 5. Divide the dough into four sections and roll each into a long rope about ¾ inch wide. 6. Cut into ¾ – 1 inch pieces. Roll each up the back of a fork, if you’d like them to have standard gnocchi markings. Curious about adding more plant-based flavors to your table? Check out our blog for more recipe inspiration! These recipes look so delicious. I can’t wait to try them! It would be helpful if you printed nutritional information, including # of servings & carbs.